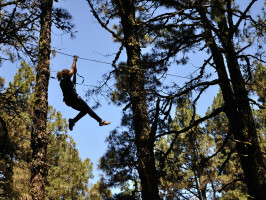 Spend an unforgettable adventure packed day in nature at Forestal Park Tenerife. 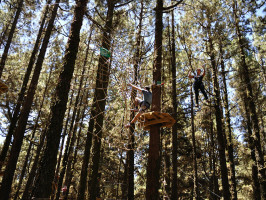 This unique adventure park is located in an incomparable setting in the protected pine forests of La Esperanza in the beautiful north-eastern corner of Tenerife. 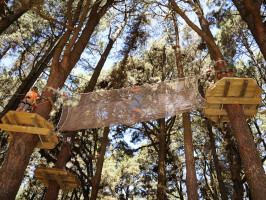 Here you'll all sorts of challenging fun and games for all ages and physical capacities including over 90 activities, platforms high up among the treetops and 11 lengthy ziplines. There are two different circuits with for different ages and abilities. You'll have the time of your life as you swing through the treetops; you'll find hanging bridges, gangways and giant spider’s webs. Climb to our 30 metres viewing platforms for stunning views of Mount Teide and the neighbouring islands. The whole park has been extremely well planned with circuits of different grades for all ages and abilities. You'll even find a professional climbing wall. Your safety is paramount here and you will receive a full safety briefing on all the safety rules and mechanisms you will need at the park. You will also receive a full set of personal protective equipment. No special level of physical fitness is required and there are activities for all ages and physical abilities. 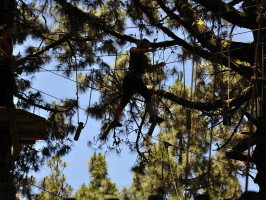 So come and spend a day jam-packed with adventure, sports, nature and fun for the whole family. The park operates on Fridays, Saturdays, Sundays, Bank Holidays and School Holidays from 10am till 6pm with last entry at 3pm and entry on the hour every hour. The park operates every day from 10am till 8pm with last entry at 5pm and entry on the hour every hour. Please arrive 20 minutes prior to start time for check-in. Redeem type: Printed Voucher. Print and bring the voucher to enjoy the activity. Meeting point: Forestal Park: TF24 La Esperanza km 16,Las Lagunetas. Opening time : Winter timetable: 1st of November to the 25th of March. The park operates on Fridays, Saturdays, Sundays, Bank Holidays and School Holidays from 10am till 6pm (last entry at 3pm, entry is every hour on the hour. You must be there 20 minutes in advance to check-in).Summer timetable: from June till September inclusive, the park operates every day from 10am till 8pm (last entry at 5pm, entry is every hour on the hour. You must be there 20 minutes in advance to check-in). Voucher validity: Voucher valid for the day of activity. Extra comments: sports circuit (minimum height 1.45m) roughly 3 hours. Family Circuit (minimum height 1.10m) roughly 2 hours.